One could say that service and dedication to the Elon community are in Edith Brannock’s blood, even going all the way back to Elon College’s very beginnings. Ms. Brannock is a descendant of Rev. James O’Kelly, founder of the Christian Church, which subsequently founded Elon College. Both of Edith’s parents were Elon graduates. Her father, Ned Faucette Brannock, graduated in 1899; and her mother, Loula York Brannock, graduated in 1898. Ned Brannock also served as the much-loved professor of chemistry at Elon for over 50 years. Following in her father’s example, Edith taught home economics at Elon for 18 years. Edith Brannock has continuously given her time and talents to the Elon community throughout her life. As a student, she was active in the home economics club. She also planned and hosted many social events for her sorority, Tau Zeta Phi. She was noted for giving a bridal shower in 1937 and helped arrange the 1938 Senior-Junior banquet. After graduating from Elon in 1939, Ms. Brannock stayed close to home and became a vocational home economics teacher with the Burlington and Alamance County public schools, where she taught for over 20 years. She joined the Elon faculty in the fall of 1962 as assistant professor of home economics and also briefly taught child psychology courses. But she didn’t just teach home economics. Ms. Brannock applied her expertise in planning and hosting numerous social events for the college. She helped to make the Danieleys’ 1963 open house “one of the highly enjoyable social events of the winter season” (Maroon and Gold, January 18, 1963, pg. 2). 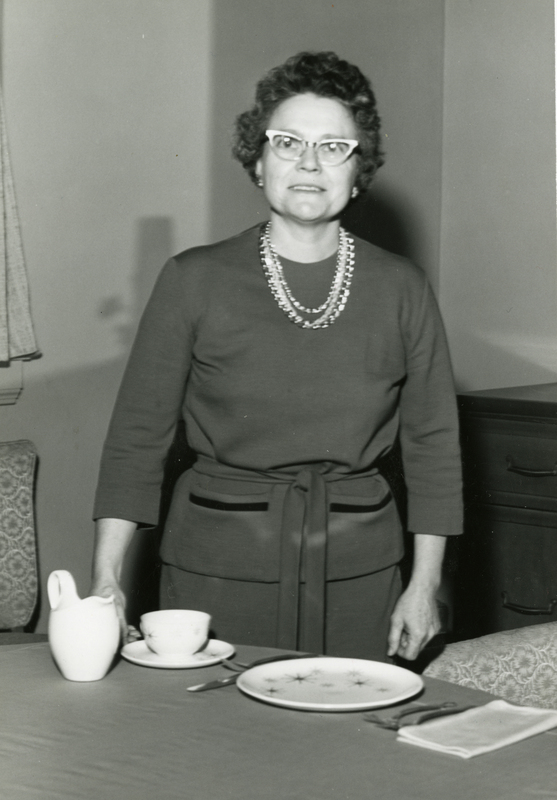 Ms. Brannock was in charge of refreshments for the 1964 welcoming reception for Mrs. Margaret Sanford, wife of then-North Carolina Governor Terry Sanford. Ms. Brannock supported students both in and out of the classroom. In 1963 she volunteered to make an Elon College flag for the Student Government Association. She retired from the faculty in May of 1980 due to the phasing out of home economics courses. After she retired from teaching, Ms. Brannock never ceased to support her alma mater. She has continued to actively serve as a member of the alumni association, especially in planning a number of successful gatherings. For instance, during the Homecoming 1999 celebrations, when Ms. Brannock “… got so many of her classmates together for their 60th reunion party that it was hard to find a seat” (Magazine of Elon, Winter 2000, p. 21). Ms. Brannock most recently gave back to Elon when she gifted to the Belk Library Archives and Special Collections her collection of recipes gathered over her many years as the expert homemaker. More about this recipe collection is available here. Later, we will highlight some of the recipes on this blog to aid our readers in preparing an unforgettable Thanksgiving meal! This entry was posted in Alumni, Faculty and Staff, Miscellaneous Events, Student organizations and tagged Edith Brannock, Heart of Gold Award, Sigma Sigma Sigma Sorority, Tau Zeta Phi Sorority. Bookmark the permalink.